risks as a result of climate change. 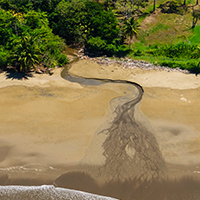 These risks are amplified when upstream activities impact coastal areas. Source-to-sea management will increase resilience of these vulnerable communities. Policy responses need to recognize the interdependencies between SDG 6, 11, 13 and 14. For instance, water use efficiency and minimized water pollution are necessary to achieve healthy oceans and a progress towards sustainable development in a changing climate future. Approaching the whole SDG framework with a holistic, hydro-lens would allow for reinforced action from source to sea and balance trade-offs between different priorities. • Integrated basin-scale management from source waters to coastal and estuarine and marine systems and their surrounding lands is essential to ensure that a full range of fresh and saltwater ecosystem services are sustained. Actors within agriculture, energy, fisheries, cities, infrastructure, water abstraction and treatment must all be collectively engaged as stakeholders in planning, operations, and management from source to sea. levels from local to national and global. Investments in governance processes and institutional capacity is therefore crucial to ensure informed, transparent, equitable and sustainable resource allocation decisions that strengthen adaptation to climate change. • Since many aspects of climate impacts are uncertain, integrated freshwater-marine solutions should be robust (spanning a wide range of potential futures) and flexible (capable of responding to unexpected or alternative futures). Financing, engineering, science, and governance are critical for climate change to be embedded in long-term decision making processes. • Marine, riparian, and aquatic ecosystems provision critical adaptation and ecosystem services for communities and economies. Thus, these ecosystems should also be represented as stakeholders with explicit water allocations, such as environmental flows.